Suspended goalkeeper Charles Itandje has apologised for his disrespectful behaviour during the Hillsborough memorial service on Wednesday – but it really is a case of too little, far too late. TV footage clearly showed Itandje fooling around during the service, incapable of conducting himself appropriately even for that short amount of time, the only time he’s been on duty in any form at Anfield this season. The player’s apology was through the Liverpool Echo, who he told: “First of all, if my behaviour has caused offence to anyone then I can only apologise. It’s difficult to work out what his intention was, but it certainly, clearly, wasn’t to show any respect to the ninety-six fans who died, to their families, and to the countless others who suffered unspeakable traumas that stay with them until this day. Itandje’s attitude has been called into question by fans for some time. Allegations have been made that he has over-indulged in the city’s nightlife during his time here, also dragging at least one of the club’s impressionable and once-promising youngsters into a world that is very-much removed from what a top club would expect from its professional sportsmen. The club don’t stop their players from going out and having a good time – but it isn’t difficult to work out which nights are best spent in front of the TV and early to bed. The allegations tie in with the reports that Rafa Benítez tried in the last two transfer window to offload the player – who hasn’t even had a place on the bench this season. These allegations first surfaced last season, when his rare performances left a lot to be desired, and included hints at his lateness or absence from training on more than one occasion. On a handsome wage, a wage he gets whether he plays or not, Itandje has so far exercised his right to refuse any moves elsewhere, choosing instead to pick up that wage for doing very little at all. Clubs are generally only allowed to fine players a maximum of two weeks’ wages. The fact Liverpool have announced an investigation alongside an immediate two week suspension has led to suggestions that they may be looking at ways to terminate his contract on the grounds of what in normal employment might be termed “gross misconduct”. Only time will tell if this apology becomes his farewell message, but it’s difficult to envisage a situation where he would ever be welcomed onto the field again by Liverpool fans. And those younger players said to have been taken in by the Frenchman, said to be risking their own careers by joining him in his frolics, would do well to reconsider their opinions of him if they want a career in football at any club, let alone Liverpool. King Kenny to come back? Liverpool fans woke this morning to a piece of news that could see an extremely difficult week end on a high note. The Liverpool Echo have reported that Kenny Dalglish could be about to make a return to Anfield as part of the team Rafael Benítez is setting up in his quest to turn the football side of operations around at the club. According to Tony Barrett, Rafa has already raised the idea with the club’s owners Tom Hicks and George Gillett and is desperate to see the move sealed as soon as possible. Informal talks are said to have taken place between the two and it seems that in principle the legend will be happy to come back. The report says Rafa sees Kenny in a role where he would concentrate in particular on providing advice on youth development, but that as well as spending time at the Academy he’d also be involved at Melwood and Anfield. This news comes after the appointment of Frank McParland to investigate the Academy set-up with a view to improving its value to the club. Kenny’s status at Liverpool Football Club is such that only those with something to hide would have any concerns about his appointment. He’s never been known to make knee-jerk comments on situations the rest of us might have blown our tops over; when he has been critical he’s always been constructive, he has always stood by that criticism. Kenny left Anfield in the aftermath of the Hillsborough disaster, needing a break from the pressure that had long-since passed the levels any other football manager is likely to ever face. He’d already gone from a legend on the field to a legend as manager; in 1989 he became a legend as a man. The Hillsborough disaster saw Liverpool lose 96 fans, with many more injured and permanently traumatised. Kenny went to funerals, visited patients in hospital, spoke with families and helped organise his players to ensure nobody missed out on support from the club. When Kelvin McKenzie pleaded for help after printing lies, headlined “The Truth”, that would lead to an ongoing 20-year boycott of ‘newspaper’ The Sun, Kenny’s advice was simple: Print the real truth, under a headline, “We Lied” in the same size font. McKenzie said he couldn’t do that – Kenny told him that he couldn’t help him then. Liverpool won the FA Cup after Hillsborough, and the following season “King Kenny” steered Liverpool to their 18th title. That was the last time the club won it. He’s referring of course to Graeme Souness, once a hero on the field but something far from it as manager. Fans blame Souness for the Liverpool downturn, and even if that was forgivable his decision to sell his heart-surgery story to The Sun will never be forgiven. So now the club’s owners have a chance to make amends for the huge errors of judgement made 18 years ago by their predecessors. If – as reported – Rafa’s happy to bring Kenny back and Kenny’s happy to come back on the terms Rafa has in mind, then it’s the easiest decision Tom Hicks or George Gillett could ever make as owners of this club. It’s time we were told: Why? I was reading one of the papers at the time, one of the many pages about the day before’s service. I was surprised at what she said. “Are you sure?” I asked. She insisted she was right. 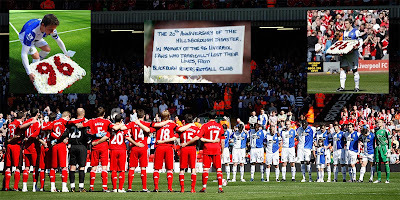 I’ve cried time and time again over Hillsborough, something I’m not ashamed to admit. But most of the time there’s an instinctive feeling that the tears have to be hidden. Dig your fingernails into the palms of your hand, bite your bottom lip, try to turn your thoughts to something else – anything but let the tears roll down. That instinct seems stronger in front of your own children. You’re there to protect them from the monsters under the bed and the bullies at school, to tell them everything’s okay even if it isn’t; you can’t really cry in front of them. So you wait until they aren’t there, until you’re on your own. But this time, sitting at the table with her, the tears had rolled down my face and my voice was breaking up as I was speaking to her. And she did know. Continue reading It’s time we were told: Why? Twenty years ago today ninety-six of our supporters went to see a game of football. They never came home again, their lives cruelly and needlessly taken from them. Ninety-six who will never be forgotten. Ninety-six who will never walk alone. Stephen Warnock yesterday made a gesture that will live long in my memory, and I’m sure I speak for countless Liverpool fans who feel very much the same. As he walked across the Anfield turf, carrying a floral tribute from his club Blackburn Rovers to our ninety-six victims, he was walking through an atmosphere heavy with the kind of emotions that really should never have been present inside any kind of sporting venue. It’s always a difficult time of year. But this year the anniversary of Hillsborough somehow feels more intense. Stephen battled back from two broken legs during his time as an Academy player for Liverpool, eventually breaking into the first team right at the beginning of Rafael Benítez’s time as Liverpool boss. He made 67 appearances for the club but was unable to convince Benítez to make him a regular first-choice, at a time when few players could describe themselves as first-choice. His competition on the left-hand-side of the pitch included John Arne Riise, Fabio Aurelio and Mark Gonzales. He nearly moved to Blackburn when Liverpool made an offer for Lucas Neill – he’d have been used in part-exchange – but when Lucas chose higher wages and a relegation battle over a move to Anfield that move fell through. But by then Blackburn were very interested in Warnock, and Warnock was craving regular first-team football, so it was only a matter of time before he moved there. Perhaps if the Champions League “home-grown” quota rules had been in place at the time his career would have gone a different way and he’d have stayed at Anfield, but he is happy at Blackburn. However, as a Liverpool player from the age of 11, he knows, understands and feels just what the anniversary means. And the Liverpool supporters know he does. He walked over to the Kop, and placed the tribute, a “96” made up of red flowers on a background of white flowers, in front of them. The Kop isn’t just the stand; it isn’t just the people in that stand on a particular day. The Kop has been there a long time. And it knew what it meant that Stephen Warnock had walked over on behalf of his new club to pay tribute. He applauded the Kop, they sang his name, and another special moment had happened in the name of the ninety-six we lost. Liverpool need to bounce back from Wednesday’s midweek Champions League defeat against Chelsea with all three points against Blackburn. To get three points Liverpool need to overcome a Blackburn side managed by former Bolton boss Sam Allardyce. After being sacked very early into his managerial career at Newcastle, and having had more than one run-in with Rafael Benitez in the past, Allardyce will be sure to make that bit more effort to see Liverpool frustrated. If the Reds are to get three points they’ll almost certainly need to do it without Steven Gerrard. The captain has been suffering from injury this week but it at least on the bench if Rafa feels he needs to call on him. Agger starts in place of Skrtel who drops to the bench, and Emiliano Insua comes in at left-back. Mascherano returns in midfield after suspension and Yossi Benayoun gets a start. Ex-Red Stephen Warnock starts for Blackburn. This is of course Liverpool’s last home game before Wednesday’s 20th anniversary of Hillsborough. Liverpool: 25 Reina, 17 Arbeloa, 23 Carragher, 5 Agger, 22 Insua, 20 Mascherano, 14 Alonso, 11 Riera, 15 Benayoun, 18 Kuyt, 9 Torres. Blackburn: 1 Robinson, 17 Andrews, 2 Ooijer, 6 Nelsen, 21 Givet, 15 Mokoena, 8 Dunn, 5 Kerimoglu, 3 Warnock, 24 Treacy, 4 Samba. Liverpool’s official website and TV channel are planning to make up a montage featuring the 96 victims of the tragedy at Hillsborough, but need another seven photos in order to complete it. The full details of LFC.tv’s request for help is posted below – and if you think you can help in any way then please try and find some time. Contact details are in the message below. If for any reason you can’t get in touch via the details provided below then please post a message to us here – www.anfieldroad.com/contact-us – and we’ll make sure your message gets through to someone at .tv. LFC TV needs just seven more photos to complete our montage of the 96 victims of the Hillsborough disaster to mark the the 20th anniversary of the darkest day in the club’s history. On April 15, we aim to feature the faces of all those who died as a result of Hillsborough on both the homepage of the website and the TV channel. On LFC TV, a photo montage – with one picture following another -will be shown with the name of each individual placed below the photo. The photo montage will be set to an appropriate musical soundtrack. Thanks to the help of the families and friends, we’ve managed to acquire 89 photos which means we are missing just seven photos. If you can help us get in touch with any of the families or friends of the seven supporters named above, we would really appreciate it. If you can help in any way, it will be much appreciated. If you can’t help, but know someone who can, please pass on this message. If you have any questions, don’t hesitate to get in touch via email Hillsborough@liverpoolfc.tv.